The Rebel Sweetheart. 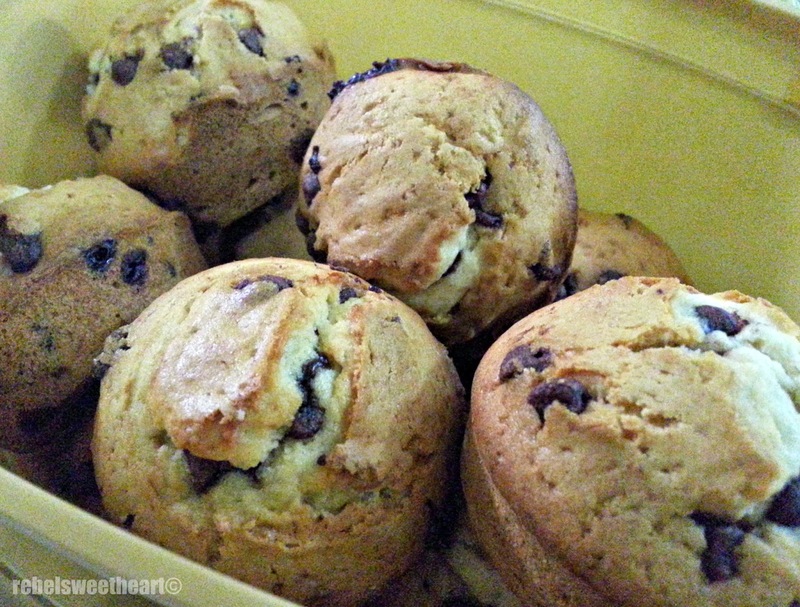 : Foodie Goodie | Chocolate Chip Muffins. I live next door to my brother, and right now there's a wonderful smell wafting from their kitchen. Apparently, he's making Chocolate Chip Muffins, and yes, my brother knows how to bake! 1. Grease twelve muffin cups. 2. In a large bowl, stir together flour, sugars, baking powder, and salt. 3. In another bowl, stir together milk, eggs, butter, and vanilla until blended. 4. Make a well in center of dry ingredients. 5. Add milk mixture and stir just to combine. 7.Spoon batter into prepared muffin cups. Bake for 15-20 minutes or until a cake tester inserted in center of one muffin comes out clean. 8. Remove muffin tin to wire rack. Cool for 5 minutes, then remove from tins to finish cooling. Serve warm or completely cool. love this one...my kids love it so much we keep baking one every week...thanks for sharing it.. It's sunny but cold here --- these muffins might wake up our morning! Thanks for the recipe. I have a brother who can bake too! I'm glad I don't live anywhere near the wafting deliciousess of his kitchen! lol These look like a tasty breakfast muffin! Delicious looking muffins! I really need to get a new muffin tin then I am going to give your recipe a go. Thank you for sharing!